Any of several bulbous plants, originally from Europe and Asia Minor, of the genus Galanthus, having solitary, nodding white flowers that bloom in early spring. Leucojum vernum. Broad, shiny green leaves and bell-shaped white flowers with green or yellow tips – rather like a ‘Tiffany’ lampshade – height 6-8”. which can be difficult to establish. Can I buy bulbs throughout the year? Almost! We send bulbs which are dormant or just starting to grow, sending them out ‘damp packed’ for immediate planting in September/October. Leucojum vernum, Galanthus nivalis and Galanthus nivalis flore-pleno. Price list available on request. In December/January we send out bulbs on emergence to nurseries and wholesalers. Late February onwards we send out ‘bulbs in the green’ – dug up as the flowers go over. These bulbs are dispatched ‘as dug’ with earth shaken off and therefore include a mixture of flowered and smaller bulbs. 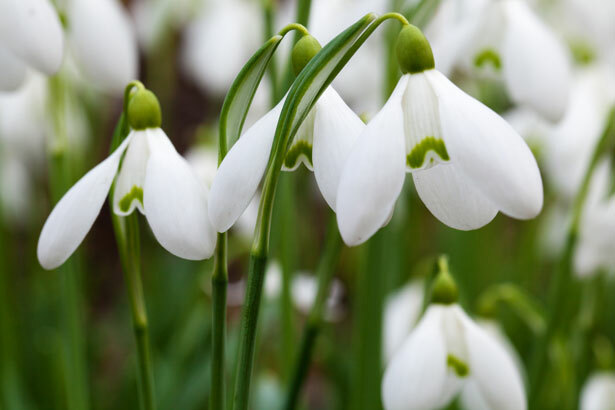 Purchasing unsorted bulbs is an ideal way to buy snowdrops to establish a woodland planting and double snowdrops are recommended in preference to singles as we find they multiply much quicker and are a showier flower if you are trying to create an effect. How to plant and care for your bulbs? Cambo bulbs are freshly dug and carefully packed in moss to ensure that they reach you in good condition. Whatever you do, don’t let your bulbs/corms dry out. Plant them as soon as possible, ideally in the shade of deciduous trees and shrubs. If this is not possible, “heel” them in until you are ready to plant them in their final position. They are woodland plants and prefer soils with a fairly high humus content. An autumn surface dressing of bone meal can be beneficial. We cannot guarantee flowering, which depends on horticultural conditions, but we believe that all bulbs/tubers dispatched by us are fine, healthy stock. Bulbs/tubers which have been transplanted may take some time to establish. We regret we are unable to acknowledge orders except where an item is unavailable or when accompanied by a s.a.e. Prices quoted are relevant to UK mainland addresses only. Rates for elsewhere on application. What should I do if I have a problem/complaint? Should there be cause for complaint, please write within seven days of receipt of order.